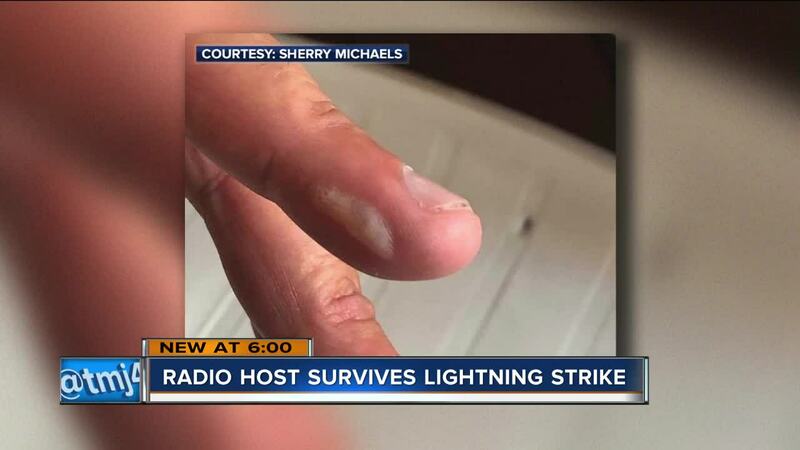 EAU CLAIRE -- Lightning struck a Wisconsin radio host while he was live on the air Thursday. 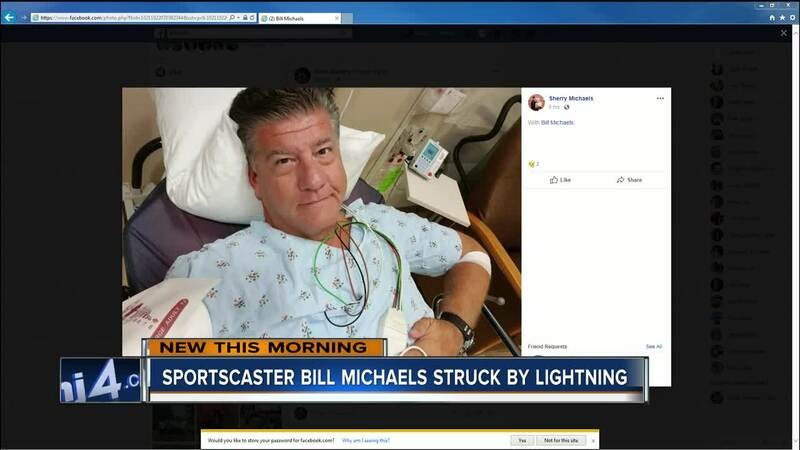 Syndicated sportscaster Bill Michaels survived the hit. "Immediately I couldn't feel my arms like below my elbows and my legs and feet," said Michaels. Michaels said he just finished interviewing Jerry Kramer at a golf outing in Eau Claire when he heard a buzz and felt a jolt. He drove himself to the hospital. He said the lightning struck his hand and foot. "The bolt or the current blew out through the bottom of my shoe," said Michaels. He was undercover outside broadcasting from a metal table. Michaels remembered hearing thunder in the distance and minutes later he heard an electric buzz. "I had my arms kind of underneath the table on my knees and touching the table," said Michaels. Michaels didn't see it, but he said someone else saw his table light up. "The best way I can describe it is like somebody had an electrical wire laying across my lap and put the plug in, pull the plug out, put the plug in, pull the plug out. It was like two quick buzzes," said Michaels. He said doctors said he was struck. "They use that term, but basically there's what they call transference and you can either be hit directly by a lightning bolt or the energy surrounding a lightning bolt and that's what I was hit with," said Michaels. The ordeal made him think differently. "It doesn't matter if you're in the direct path or holding a golf club up in the air, you could be struck anywhere and I was never a believer in that and I am now," said Michaels. He is surprised by the attention, including Gov. Scott Walker's tweet.
. @Bill_Michaels Knew you had an electrifying show but this is taking it to a whole new level. Glad to hear you are still with us! Get well. "I guess I'm lucky it wasn't a direct hit, but never the less it was a pretty freaky experience for lack of a better term," said Michaels. Bill said he still doesn't have all the feeling back in his arms and legs.